It is Fire Prevention Week and Club Kids will be learning all about fire safety! The kids will get to practice their “stop, drop & rolls," do some “ladder” climbs, listen to books, make fire safety crafts, and talk about what we would do in case of a fire. It is sure to be a week full of fun & learning at the gym! These are just some of the nursery rhymes we will have fun with at Club Kids this week! Bring the kids by for crafts, work outs, sensory play and LOTS of book reading. They’ll have a great time all while mom & dad are right up the stairs getting a peaceful workout! 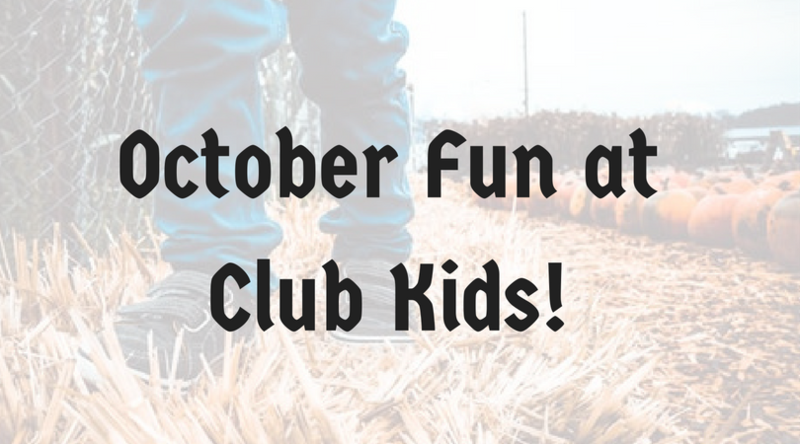 Club Kids will be having lots of SPOOK-TACULAR fun this week! Don’t miss out on the “spooky” crafts, slime making, pumpkin cleaning, silly games and books, spiders & webs on the sensory table, and so much more! If you stop in on Halloween, we will even have a little trick-or-treat and you are more than welcome to come dressed up! The farmers have been working hard this fall to harvest their crops. At Club Kids we are thankful for this and are having a harvest themed week filled with crafts, games, books, workouts & so much more. It will be a PLENTIFUL HARVEST OF FUN!